Bunny Day occurs on the same day as Easter Sunday, and combines the two Easter traditions of decorating hard boiled eggs and hiding those eggs to hunt them down. Since it's Bunny Day, of course you also need a bunny! 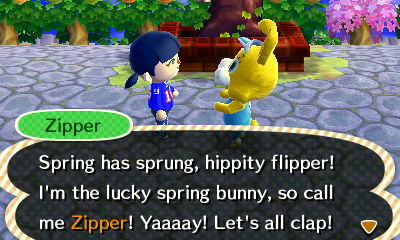 Go visit the plaza, where some unknown character has dressed themselves in a bunny suit for the day and calls themselves Zipper T. Bunny. On your way to the plaza, you should notice something odd. You expect to see an extra rock and a handful of digspots, but instead you find that there are a lot more than normal! This is all part of the fun that Zipper T. Bunny has provided, so go visit him at the Plaza any time after 6am on Bunny Day up until 5:59am the following morning. He will tell you that there are six types of eggs hidden around your town, and encourages you to track down all six and bring them back to him in return for a present. Just be sure not to approach Zipper from behind. He's very sensitive about not being unzipped from his suit and having his identity revealed! Bunny Day is held on Easter Sunday. Since Easter is determined by the Lunar Calendar, the exact date varies each year. However, Bunny Day is always held between March 25th and April 25th. The following is a list of all Bunny Day dates for all of the years that New Leaf is designed to be played. 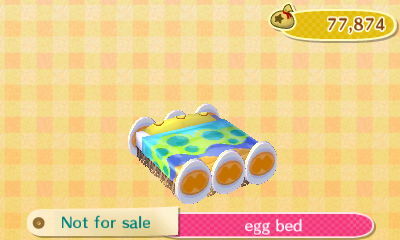 Well, that's five places, but there are six types of eggs! Here's a handy table showing which eggs are available, where and how they can be obtained, and what tools you may need. Wet Suit Swim in the ocean and look for medium-sized shadows. Shovel Unearth digspots around town. You won't find any on the beach. Slingshot* Keep an eye out for balloon presents and shoot them down. Shovel or Axe Look for extra rocks and smash them. None Shake any non-fruit tree and one of these eggs may fall out. Fishing Rod Fish up a small shadow (about the size of a horse mackerel) from either the sea or the river. *You can also use a net, shovel, or axe. See the New Towns section for more information. 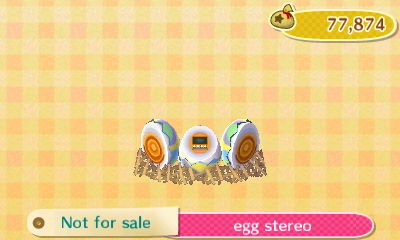 Eggs are made to be cracked open, but before you even think about cracking them open it is worth noting that there is a special item to be obtained by giving Zipper one unbroken egg of each of the six types. See the Collectibles section for more information. 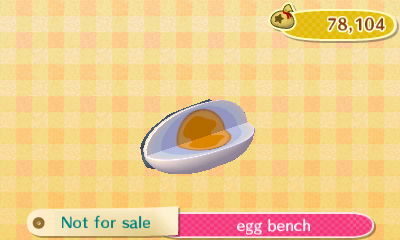 The candy can either be eaten in the same way your character eats the eggs, or you can sell it to Reese at Re-Tail for 100 Bells per piece. 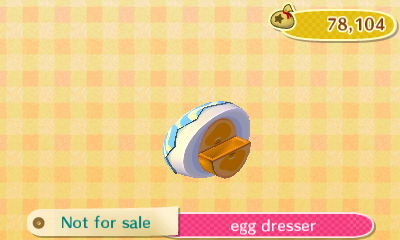 Alternatively, with all the extra storage in New Leaf: Welcome amiibo you can save the candy for Halloween. The Winning Ticket and Grand-Prize Ticket can be handed over to Zipper for special prizes. Read the Collectibles section for more information! Note that the number of Earth, Stone, and Tree Eggs are limited for each character. This means that you should be careful about eating them as you won't necessarily be able to obtain more, which may prevent you from trading one of each type for an Egg Basket. All other types of Eggs spawn throughout the day, so you won't have to worry about eating the last one. 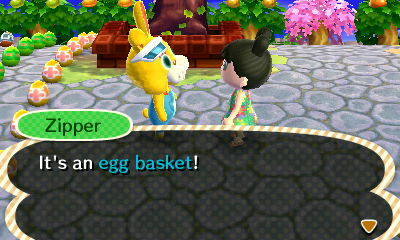 Give Zipper one of each type of Egg and you will receive an Egg Basket. Only one of these items per character may be obtained each Bunny Day. 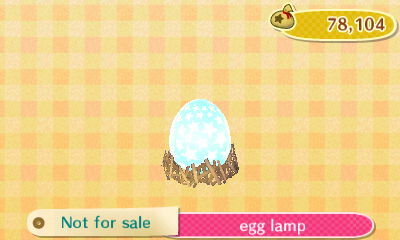 Reese will buy the Egg Basket for 200 Bells. 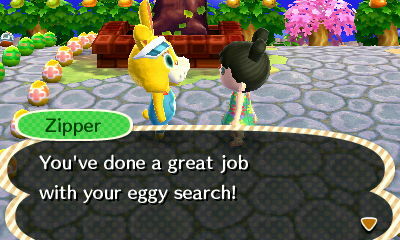 It is worth collecting and eating lots of eggs on Bunny Day just to get the Winning Tickets. 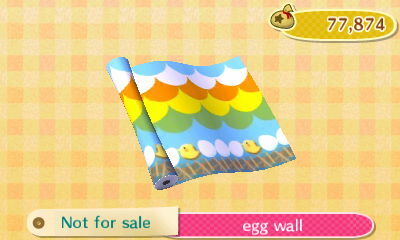 Each one of these tickets can be taken to Zipper and exchanged for an item from the Egg Series. 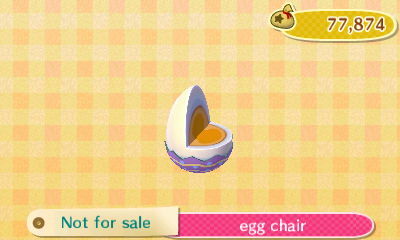 Best of all, once you have all the furniture you'd like to keep, the remaining Winning Tickets can be exchanged for more Egg Series items which you can then sell for a lot of Bells. 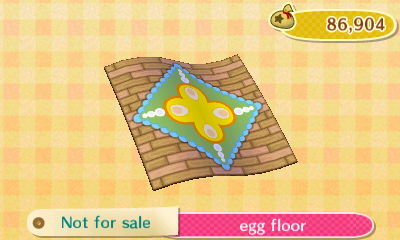 The furniture items sell for 9,000 Bells a piece, and the Egg Wall and Egg Floor sell for 8,888 Bells each. The Grand-Prize Ticket is grand by name, but not by prize. You can exchange this ticket for a picture of Zipper. This is a fabulous addition to your picture collection if you don't already have Zipper's pic, but unfortunately you will find more than one of these tickets. 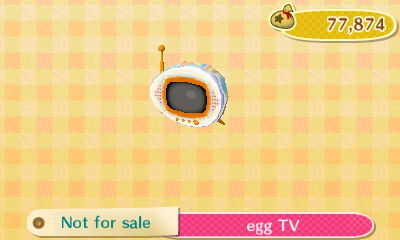 These tickets can't be sold or recycled at Re-Tail, and if you go to the effort of exchanging the extra Grand-Prize Tickets for more Zipper's Pics, they can only be sold for 10 Bells a piece. Therefore, it's easier to dispose of extra Grand-Prize Tickets in a trash can Public Works Project or any type of bin furniture in your house. Zipper initially requests one of each of the six eggs, for which he will present you with an Egg Basket. 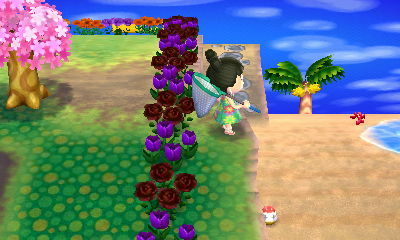 However, if you have a fairly new town and haven't yet got a wet suit to go diving, you won't be able to get the Egg Basket. That doesn't mean the day is over though. 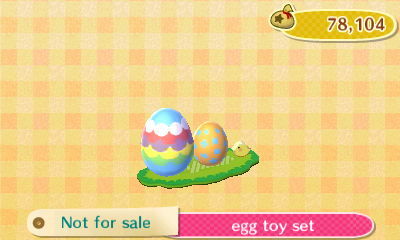 You can still get the other Eggs as well as the other collectibles. 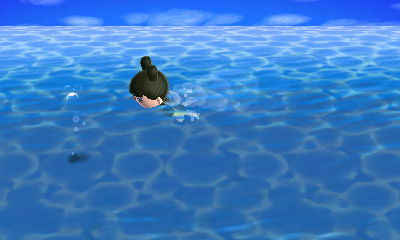 Another downside to a brand new town is the lack of tools. Go visit the store run by the Nooklings and purchase any tools you can. Afterwards, go visit Isabelle at the Town Hall. Speak to her at the counter and you'll see several options appear. One of the options will be "advice for living here". Choose this and your character will need to follow Isabelle's advice, but will be given access to more tools as a result. Isabelle will ask you to introduce yourself to the villagers that live in the town. You should speak to more than half to satisfy this request. Keep speaking to Isabelle and she'll give you advice about letters. Continue speaking to her and asking for advice and Isabelle will ask for a seashell. Give her a seashell and she'll gift you with some foreign fruit. This is fruit that isn't native to your town. 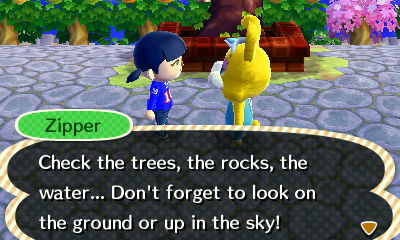 Isabelle will also give you advice on planting the fruit and how to use a shovel. If you've already acquired a shovel from the Nooklings, you can continue asking Isabelle for advice and will get the option of choosing to try fishing or bug catching. Depending on your choice, Isabelle will offer to sell you a fishing rod or a net for 500 bells. It's therefore important to have visited the Nooklings beforehand in order to get the widest range of tools possible. If you haven't acquired a slingshot, you can still nab the Sky Eggs with a net, shovel, or axe. It takes longer, and needs to be perfectly timed, but it is possible. Listen out for the balloons presents, and if they are heading towards the beach-facing cliff, go wait for it at the clifftop edge. 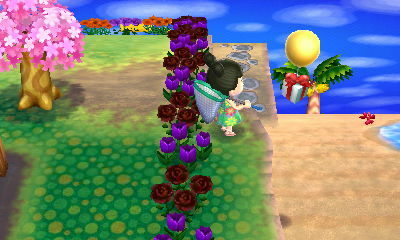 As it passes over the cliff edge, the balloon present will start to lower and you will be able to swipe the balloon with the net, shovel, or axe. Please note, this means that the Sky Egg drops onto the sand below. 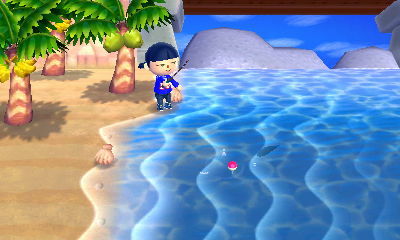 Therefore, if you've not got a wet suit, obtaining Sky Eggs with this method will only work if your town has direct access to the beach where the Sky Eggs are landing. Does the Easter Bunny really exist? Who knows? But if you approach Zipper T. Bunny from behind, on-screen he will turn around and you see a very large zip on his back. This, and his own dialogue, suggests he (or maybe she!) is wearing a costume. 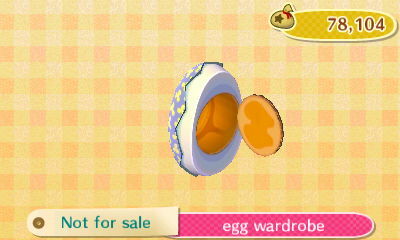 The Egg Series items sell for high amounts at Re-Tail, but you can get even more if you hang onto the extra items until Reese at Re-Tail is offering double Bells. Just look out for the premium offer, which is posted daily on the noticeboard outside of Re-Tail. Placing one piece of candy on the ground will attract ants. This is useful if you still need an ant for your Museum, or you can keep the ant in your house (it will appear as an ant farm). 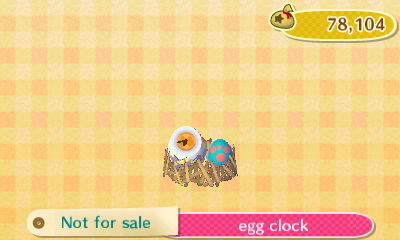 Each character in your town can play Bunny Day, and each will have a set amount of Earth Eggs, Stone Eggs and Tree Eggs generated for them. If a character is played and then the game ended without that character hunting down all of their Earth, Stone, and Tree Eggs, those eggs will still be available when reloading the character later. However, if another character is loaded before those eggs are hunted, the game will generate extra eggs for that second character alongside the uncollected Earth, Stone, and Tree Eggs for the first character. If those eggs are collected by the second character, then the eggs won't be later available for the first character. Your character can participate in Bunny Day when visiting other towns, although there won't be any extra Earth Eggs, Stone Eggs or Tree Eggs generated. Hunting for Deep-Sea Eggs? Does any part of your cliff top have the sea directly below it? Take a shortcut by diving off from the cliff top. Anyone who received enough Pavé series duplicates to sink a ship can rejoice. As long as your character has never picked up or already acquired the Egg Series items, Zipper will give you the entire set of the Egg Series with the first 13 Winning Tickets given to him. Any further Winning Tickets given to him will result in random duplicate Egg Series items. Your character doesn't have to give Zipper one each of the six types of eggs first. 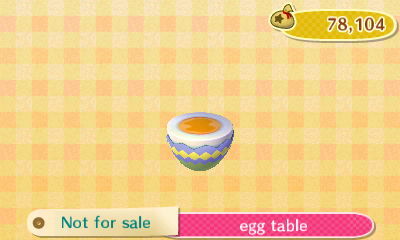 You can crack open eggs to get the Winning Tickets and swap those for the Egg Series items first. As long as you still have one of each of the six type of eggs left, you can give those to Zipper at the end and still receive the Egg Basket. Earth Eggs, Stone Eggs, or Tree Eggs spawn in limited numbers. Deep-Sea Eggs, Sky Eggs, and Water Eggs are unlimited and will spawn regularly throughout the 24 hours of Bunny Day. If you time-travel backwards a day, and forwards again to Bunny Day, Zipper T. Bunny will still appear and you still will get unlimited Deep-Sea Eggs, Sky Eggs, and Water Eggs. However, no Earth Eggs, Stone Eggs, or Tree Eggs will spawn. You will have to wait until the following year.